Final Report should have said. A FIRESTORM IS AN AIRBORNE FLUIDIZED BED FURNACE. A general scientific discussion of the nature and behaviour of firestorms; the proven life-saving ability of "dugouts" (aka dug-outs, air-tight underground bunkers); and the importance of cutting greenhouse gas emissions to prevent the Aussie bush from becoming even more flammable. Online here or at the Royal Commission website. "IT'S SAFE TO WATER-BOMB AN ELECTRIC FIRE FROM AN AIRCRAFT!!" ELECTRICITY INFRASTRUCTURE WAS THE MAIN KILLER ON BLACK SATURDAY. According to compelling evidence of Victoria Police witness Detective Superintendent Paul Hollowood, examined under oath at the 2009 Bushfires Royal Commission (VBRC), seventy per cent of the Black Saturday fatalities were the result of firestorms ignited by powerline sparks: see this TV News Report of 9th September 2009. Later in 2009, the Royal Commission heard damning evidence from regulation expert Graeme Hodge of Monash University, that Victoria is in a state of regulatory failure in respect of the privatized electricity monopolies. Based on the evidence of former Energy Safe Victoria (ESV) director Ken Gardner, and media releases of the current ESV director Paul Fearon, the state's energy regulator was, and still is, in denial about its abject failures and weaknesses. Mr Fearon is such an unbeliever in assertive public policy that he seemingly does not see himself or his organization as instruments of public policy. It is such an alien, unwholesome concept to Mr Fearon that he puts the expression "public policy" in quotation marks! With this sort of corporatist GroupThink infecting the minds, and paralysing the limbs of those in the regulatory community, the state government and the energy regulator are going to need the re-introduction of strong prescriptive regulation, and must find some strong leaders to get the "rapacious private companies" (Commissioner McLeod, page 13,464 of the VBRC transcript) back under some semblance of effective control. Once we have some regulatory control re-established, we can mandate that rural power lines must be shut down pre-emptively on days like Black Saturday, as the gale-force 45-degree-Celsius (115°F) winds thrash and crash their way across our jurisdiction. South Australia already has such a provision, southern Californian power companies have already proposed it in the USA, and Victoria itself was on the brink of introducing planned shutdowns way back in 1983 after the Ash Wednesday firestorms. The precedents are there, we just have to figure out a practical way of implementing "Victoria Unplugged" to save lives during these quite rare events when gale force winds, extreme heatwaves and drought combine in a potentially catastrophic mix. Under Section 30 (1) of the Country Fire Authority Act 1958, the CFA's Chief Officer already has wide-ranging powers to prevent fires. So Russell Rees, who seemingly knew in advance that powerlines were odds-on favourites to ignite catastrophic fires on Black Saturday, could have ordered the power companies to turn off sections of the power grid, whenever and wherever the Bureau of Meteorology computer modelling was predicting winds gusting to over (say) 80 km/hr. Many lives and great enduring grief could have been saved though that simple act of strong leadership and initiative. If the Royal Commission Final Report does not strongly recommend that the State Coroner must hold an immediate public inquest into the Murrindindi-Marysville firestorm, then I shall be making a formal application to the Coroner for such an inquest to take place, using Form 27 on page 77 of Coroners Court Rules 2009. I encourage all Murrindindi and Marysville-region residents to also apply to the Coroner for this public inquest, if you have any evidence of possible non-arson causation of this fire, or even if your "peace of mind" demands that the evidence regarding powerlines should be examined publicly and in detail. 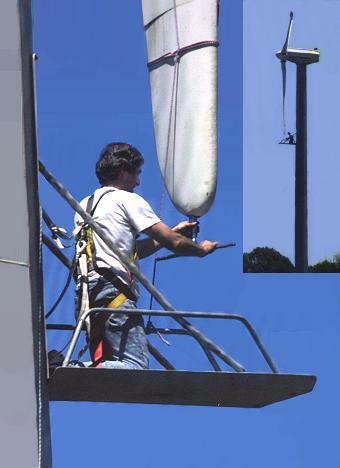 Independent technical experts must have all the evidence put on the table, so that it can be categorically PROVEN one way or the other if powerlines were responsible or not. Because I had some prior experience in the power generation industry, I focussed on electricity. It is of course entirely possible that some other ignition source was present at the point of origin: electric fence spark, diesel exhaust, angle grinder, overheated hay bales in the nearby hayshed, plastic sheeting snagging in the powerlines, a careless smoker, or even a psychopathic, sociopathic arsonist. Here is my photographic evidence of a probable conductor clash mark close to the point of origin of the fire, and a scale diagram of the poles, spans, and helical wraps nearby. 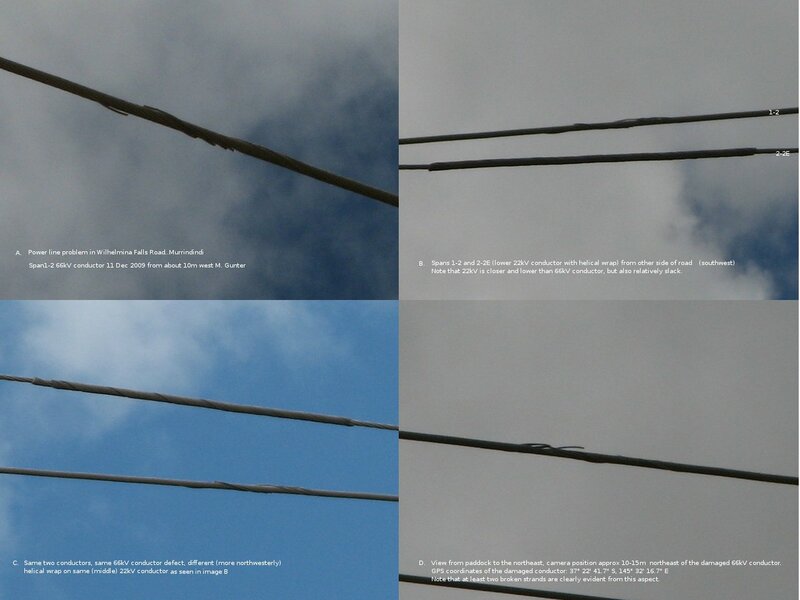 These images accurately locate the scarred conductor in both degrees/minutes/seconds and in UTM units, so grab some binoculars and a GPS device, and go have a look for yourself. OPINION: "BAD POLICY DERAILED MURRINDINDI INVESTIGATION"
An addition to YouTube in 2010 was this montage of two TV news stories from the Black Saturday anniversary (7th Feb 2010), with text commentary beneath the video clip arguing that Victoria's fire investigation policy shows institutionalized bias towards arson. (added 20 January 2011, updated 27 June 2011) The 2009 Bushfires Royal Commission (VBRC) had access to many historical reports into bad fires including the 1939 Black Friday fires, the 2006 alpinie fires, the 2003 Canberra fires, and the 1983 Ash Wednesday fires. Equally important to those inquiries' reports was a 1977 document "Report of the Board of Inquiry into the Occurrence of Bush and Grass fires in Victoria" by its chairman Sir Esler Barber. It dealt with a devastating series of fires that broke out in hot windy weather on 12th February 1977. It found that most of the fires were caused by sparks from electricity distribution wires. Six people died. Many were hospitalized with non-trivial burns. In 2009 after Black Saturday, the VBRC had full access to the 1977 Report. However the full text of the transcripts and exhibits from Sir Esler Barber's Inquiry were in long-term storage, awaiting processing by the Public Records Office of Victoria (PROV) in order to be catalogued and made publicly available. Some time towards the end of the 2009 VBRC (May 2010), or perhaps around the time that VBRC's final report was released (31 July 2010), PROV finished its cataloguing and the records became accessible to the public. Part 1 Farmer Colin McKenzie's shocking account of events during and after a bad fire. (image-only text, from low quality archival source. PROV allows digital cameras but not scanners, so legibility is an issue here). Part 3 Exhibit 263: CFA Fire Statistics should be read in conjunction with Part 2, the S.E.C. statistics. Again I have added notes/analysis/opinion in both a preface and end-notes. The end-notes in Part 2 make a "giant leap forward" to 2011, and relying very heavily on my detailed technical understanding of what killed most people on Black Saturday 2009, I basically call for strong re-regulation of the privatized electricity distribution monopolies, owned mostly by Asia-based corporates. Part 4 The Missing Files is basically some photographic evidence of empty folders, but has a serious purpose, in asking anyone with knowledge of which agency placed blue marker tabs in the stead of two important documents, to find and return the missing files to the state archive, the Victorian Public Records Office, aka PROV. Exhibit 216 and Exhibit 279 were both crucial reports on experiments proving power lines were known by this industry to ignite fires. Data collated (so far) from government archives of the 1977 Inquiry is presented here in a convenient spreadsheet format. At present it contains data ONLY for the 12th February 1977 fires, but when time permits a similar exercise will be attempted on the 1969 data. Please note that it shows that all six deaths on 12/2/77 were caused by fires ignited by electricity distribution wires or fuses. The problem of power line sparks igniting firestorms with the potential to kill scores of people, possibly even to invade urban areas and kill thousands, is a problem demanding a guaranteed cure. Following Black Saturday, the state's regulatory authority, Energy Safe Victoria has been tasked by government to fix the problem. My recent submission (24/6/2011, updated v2 6/7/2011) to their public consultation process highlights fatal flaws in the process. The process seems doomed to failure if it refuses to publicly discuss planned power outages.